According to ArizTon, a market research company, the healthcare staffing market in US is expected to cross $28 billion by 2023. The healthcare industry in the US is witnessing a shortage of nurses in the country. Despite the fact that registered nurses are among the single largest healthcare professionals in the country, the vacancy rate for registered nurses is growing. Our client is positioned to serve this growing market. 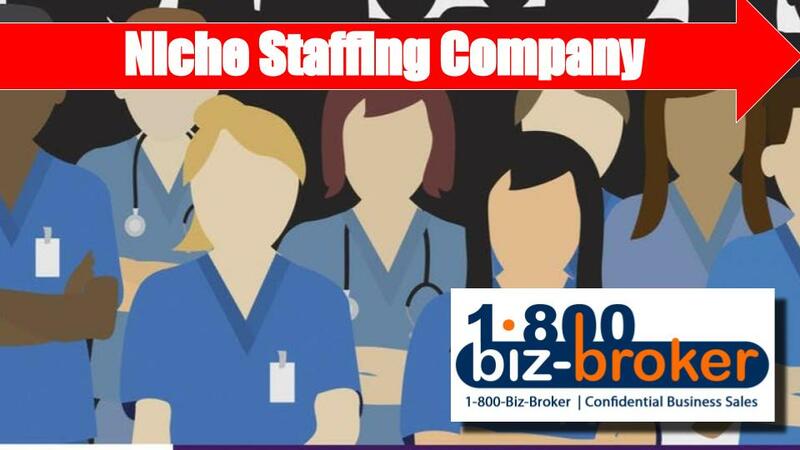 Established & Profitable Niche Staffing Firm focused on placing nurses, LVNs, caregivers, etc to Hospitals, Clinics, Assisted Living, Re-Hab and Medical Offices. Fully staffed. Four key employees handel operations, A/R, marketing, and HR. PLUS over 300 active RNs, LVNs, CNAs, Caregivers in their database. Seller wants to sell to focus on family and other business (app business). Seller will stay on to help transition business. Excellent books, records, & tax returns. Should qualify for SBA financing (pre-qualification in progress). Maintain and Grow relationships with Hospitals, Medical Facilities, Residential Care, Assisted Living Facilities, etc. Maintain and grow database of Nurses, LNVs, Caregivers, etc. According to the recent semiannual update of the US Staffing Industry Forecast, the healthcare staffing market in the US is projected to grow 6% this year and 5% in 2019 in terms of revenue. Thinking about selling your business? We can help you.